These are as genuinely Fornasetti as the sky is green but they’re bloody gorgeous fakes and a bargain at only £7.30 each! They’re being sold on AliExpress, a site I discovered recently as a recommendation from a friend. I’ve yet to actually order anything and every item sold comes from China, but my friend has goto some great things so far; just make sure to allow around 30 days for delivery and you may pay import tax depending on what you buy. Fornasett cushion cases £7.30 here from AliExpress. With quite a few phones offering this function as a built in feature (I think some of the Samsung’s) the iPhone family is really lacking behind on the wireless charging front. However, for next to nothing, you can apparently rig it up yourself with one of these wireless charging cards for £7.50 and one of these wireless charging stands for £7. I have no idea if this would work but from what I’ve read, it does. Have you tried wireless charging yet? I’m actually reviewing their latest product at the moment, but Neom Organics have always been a fabulous company and pretty special to me for a number of reasons. November before last, my mum was diagnosed with breast cancer. It was small and quickly removed, but left her in a real mess both physically and emotionally; the effects of which are still apparent now. Whilst she was recovering, I was contacted by Neom who had seen something on Twitter and sent my mum a huge box full of their products. I was absolutely overwhelmed and so was she. Since then, my mum has been a Neom addict, the house is full of fabulous fragrances, lotions, washes and bath products. The smell is just intoxicating. The brand recently relaunched with new packaging and it’s absolutely gorgeous (although the first wave did suffer with wonky labels and other such niggles). Come to visit the parents and Mum’s clearly been to @NeomOrganics. Smelling delicious! Made with natural waxes and formulated with a whopping 30-40ml of pure essential oil, the Tranqulity candle is blended with English Lavender, sweet basil and jasmine and has a burn time of 50 hours. 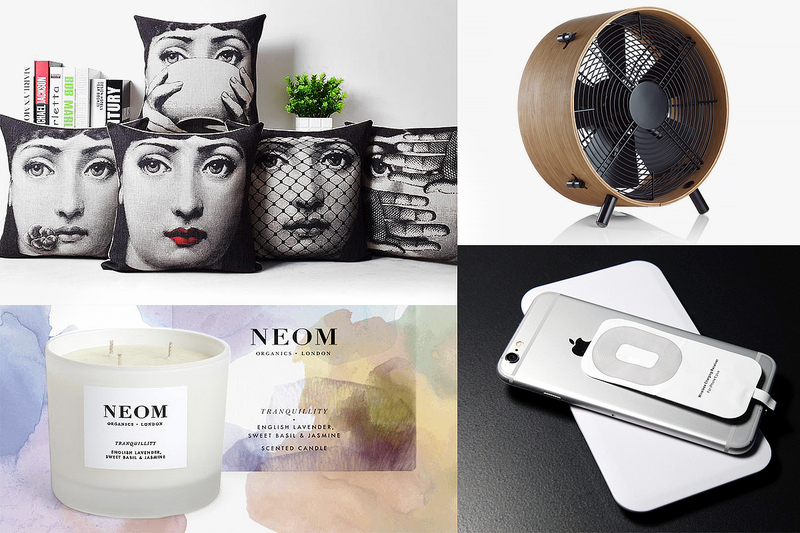 All Neom’s scents are intoxicatingly powerful and can effortlessly brighten up the biggest spaces. It’s getting hotter and hotter at the moment and I’m keeping my windows open later and later. The problem with that of course is when you’re a prescription-taking hay-fever sufferer, it almost kills you. So what do you do when you’re too hot and can’t keep the windows open for very long? A fan, silly. The Stadler Form Otto Fan available on Amazon is pretty gorgeous, made with solid bamboo and running at high-speeds on less power than a standard lightbulb. At £149, it’s obviously not the cheapest thing in the world, but there’s one thing you can’t deny from this Swiss brand, it’s absolutely beautiful, right? This article first appeared on MANFACE written by Thom Watson. It was published on Sunday 17th May 2015 and was last updated on Monday 3rd April 2017 at 1:28pm. It's categorised under Sunday Lust List where you'll find more related content. How have I never heard about wireless iPhone charging? !